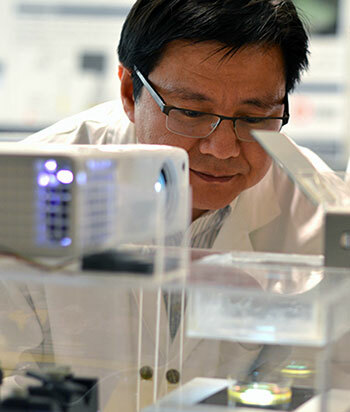 Researchers from UBC’s Okanagan campus hope to make advances in tissue replacement and cancer research through a new technology that can produce living, 3D printed bio-tissues. The new system, called direct laser bio-printing, is able to print artificial tissue at a much finer resolution than what’s currently possible and can support healthy, living cells with 95 per cent effectiveness. Kim’s research, which was an interdisciplinary project from UBC Okanagan’s School of Engineering and Department of Chemistry, tested the artificial tissue’s ability to support healthy cells by building a pattern that encapsulated a commonly used line of breast cancer cells. "Bio-tissue printing applies knowledge in biology, chemistry, and microfabrication toward the health sciences,” says Holzman. “I think our recent success in bio-tissue printing came about from the multidisciplinary nature of our team." The research, published recently in Advanced Healthcare Materials, was supported by Discovery Grants from the Natural Sciences and Engineering Research Council of Canada (NSERC) and the Canadian Foundation for Innovation John R. Evans Leaders Opportunity Fund.